You can't escape your self. I'm surprised and kind of excited to report we have a rather impressive poster to start off the New Year right when it comes to poster art. 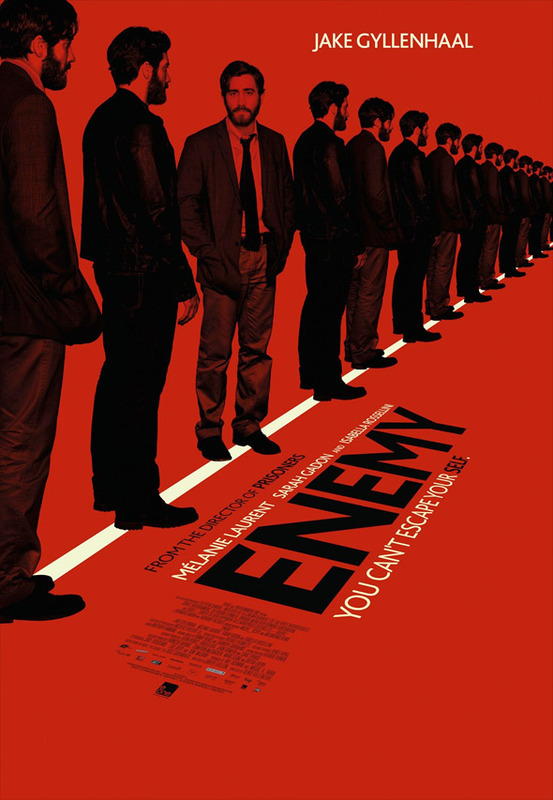 A unique, very red poster for Prisoners director Denis Villeneuve's other film with Jake Gyllenhaal, titled Enemy, has debuted via IMPAwards. Adapted from another novel called The Double (not related to Richard Ayoade's film) the story is about a man who seeks out his exact look-alike after spotting him in a movie. The cast also includes Mélanie Laurent, Isabella Rossellini and Sarah Gadon, but it's only Jake Gyllenhaal over and over on this poster. There was a trailer for this film once, but it was pulled, now we're waiting for the real one from A24. Until then, check this out. After Prisoners, I'm officially a fan of Gyllenhaal. I really really hated Incendies. So boring and pretentious.